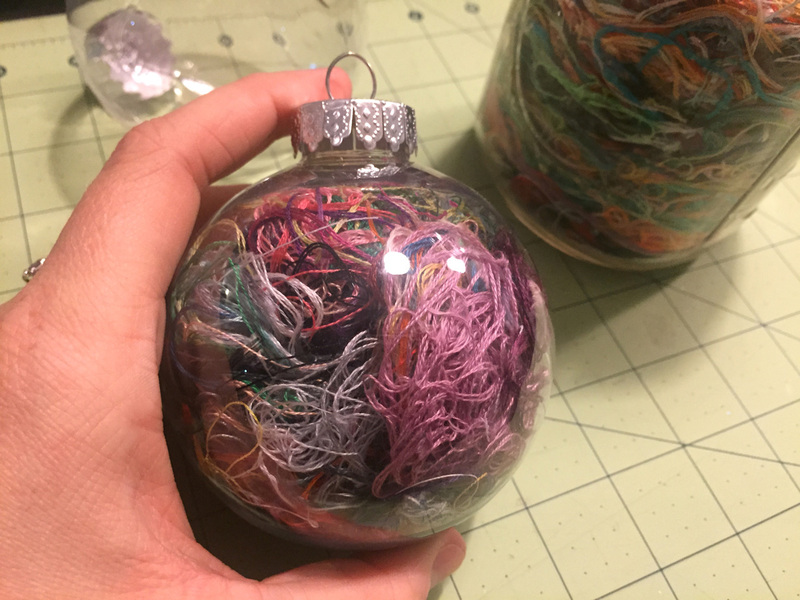 I have two big mason jars full of embroidery thread, this is the one from last year and I’m keeping one this year as well. I was doing monthly posts about my ORT jars but that kind of fell by the wayside, though I am still filling mine up. 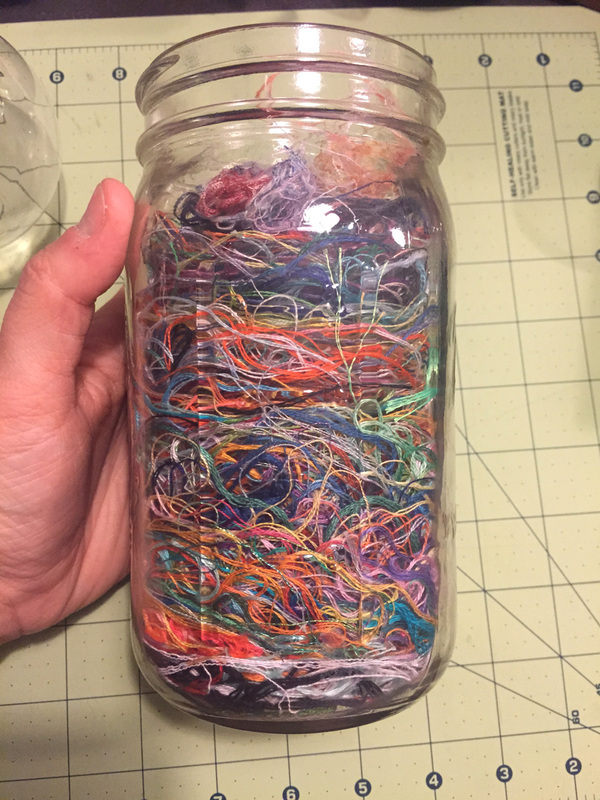 I’ve been wanting to do something with the threads so I’ve been keeping these jars around. Just take the top off and fill it with the embroidery threads. 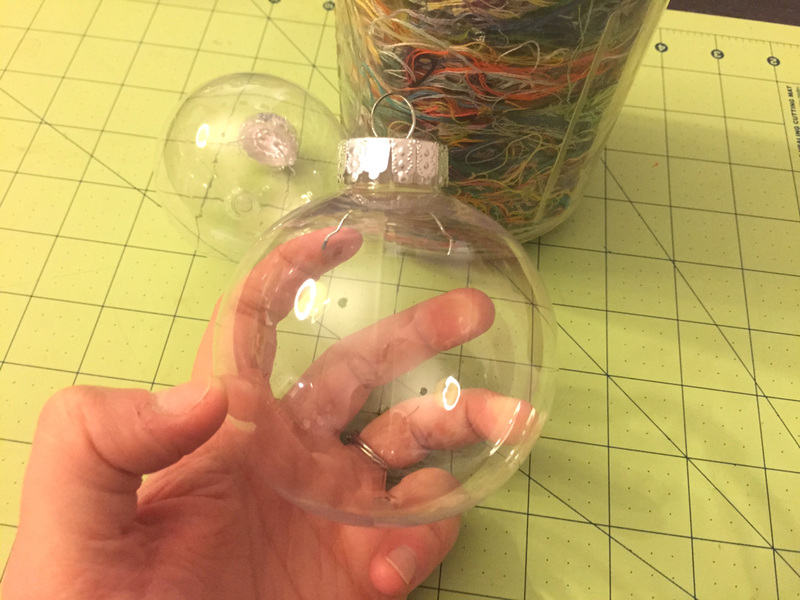 The larger ornament I was able to get my finger into easily enough to push it around, but the smaller one I needed to use a chopstick to pack it in. I really loved making these because I could identify specific projects when I would get to a layer of threads, so it was a trip down a stitchy memory lane! 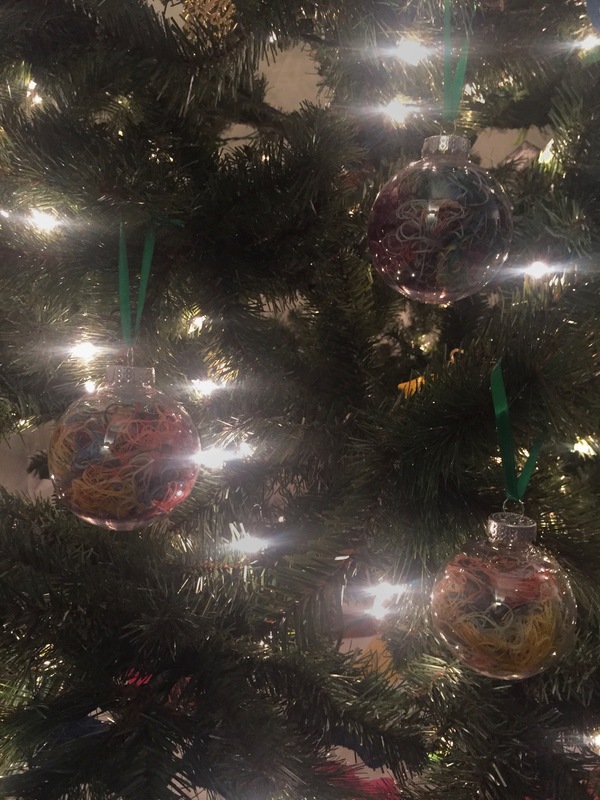 I really love how they look on the tree, but it didn’t make much of a dent in my ORT jar from last year. 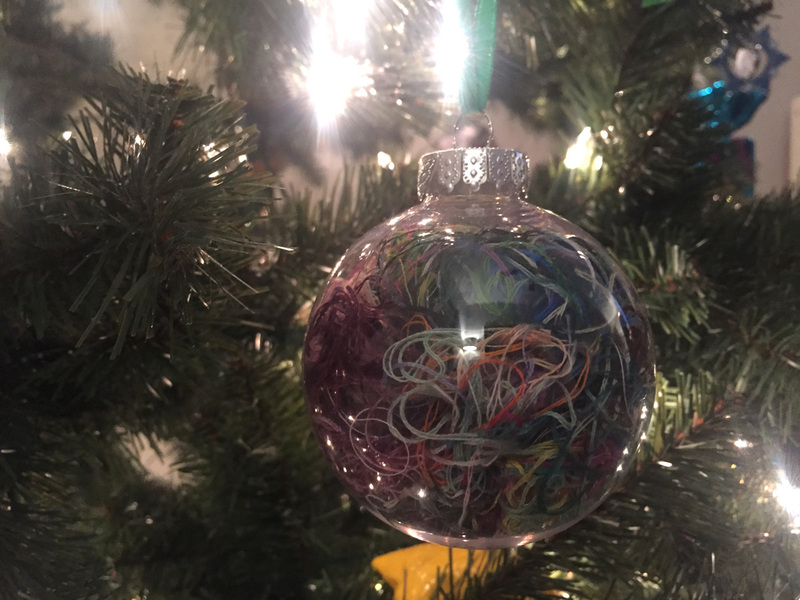 I still have a ton of thread left, plus all the thread from this year. Thankfully I have another project in mind, though it’ll have to wait until after Christmas! Ooh, I’ll have to wait and see what your next project is… I store my threads as well (it’s easier than corralling them just to throw them away!) 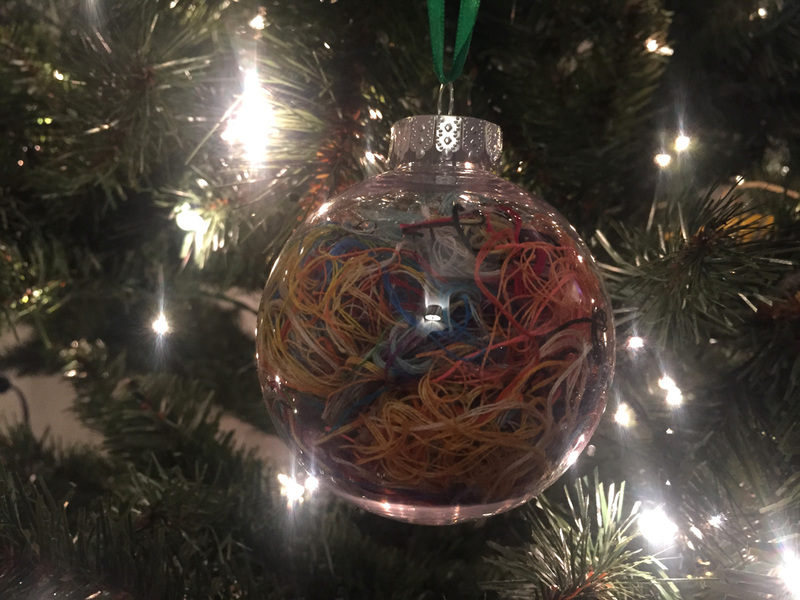 but I don’t like the idea of Christmas tree ornaments, so maybe I’ll like your other idea better! I hated throwing away so many colorful bits and so I loved the TUSAL. But the year ended and I couldn’t bear to part with the scraps! I made one of these this year too! Great minds think alike! 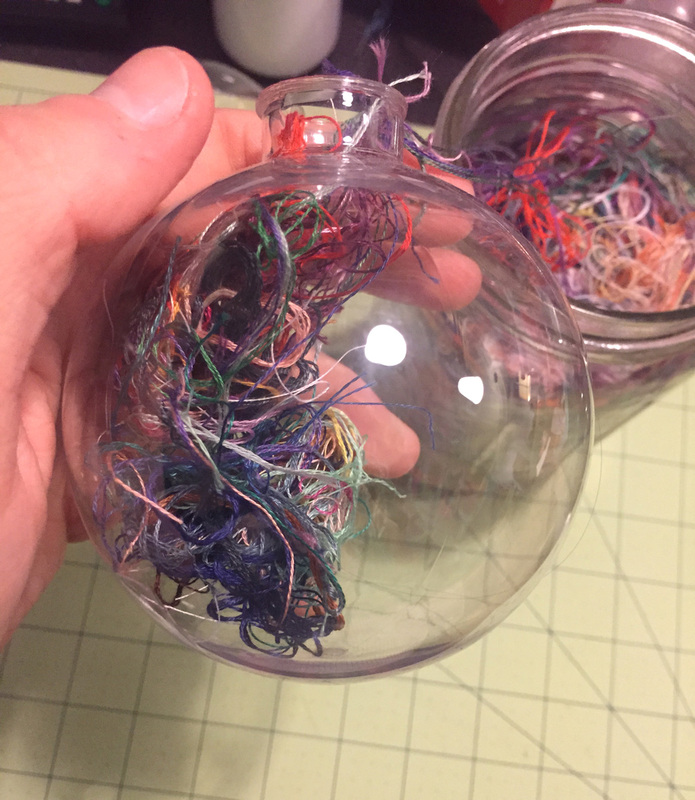 I made something similar a while back – hollow glass ornaments filled with different Christmas ribbons. So fun! Ooh I bet those were super cute! I LOVE this idea!! My friend and I are collaborating on an ort jar together and this would be a nice thing to do once our jar is full! !